This book was rather slow moving but over time developed deeply. 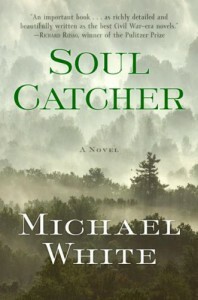 The era is pre civil war and the protagonist is a "Soul catcher," a man employed to track runaway slaves and retreive them back to their "lawful"owners. He doesn't like his job, but sees himself as providing a service in accordance with the law. Although his conscience tugs, he prefers not to dwell on the deeper moral issues until he meets the likes of Rosetta. I enjoyed this book, and digested it very slowly. It's gritty and real with characters that are flesh and blood and multilayered. It's not a fast or a light read. I was a bit disappointed with the ending though. It lacked the denouement I had anticipated, but I highly recommend it nevertheless.